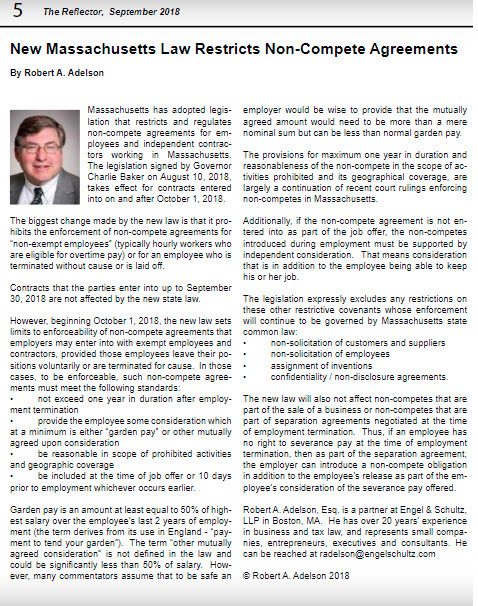 Massachusetts has adopted legislation that restricts and regulates non-compete agreements for employees and independent contractors working in Massachusetts. The legislation signed by Governor Charlie Baker on August 10, 2018, takes effect for contracts entered into on and after October 1, 2018. The biggest change made by the new law is that it prohibits the enforcement of non-compete agreements for “non-exempt employees” (typically hourly workers who are eligible for overtime pay) or for an employee who is terminated without cause or is laid off. Contracts that the parties enter into up to September 30, 2018 are not affected by the new state law. Garden pay is an amount at least equal to 50% of highest salary over the employee’s last 2 years of employment (the term derives from its use in England – “payment to tend your garden”). The term “other mutually agreed consideration” is not defined in the law and could be significantly less than 50% of salary. However, many commentators assume that to be safe an employer would be wise to provide that the mutually agreed amount would need to be more than a mere nominal sum but can be less than normal garden pay. The provisions for maximum one year in duration and reasonableness of the non-compete in the scope of activities prohibited and its geographical coverage, are largely a continuation of recent court rulings enforcing non-competes in Massachusetts. Additionally, if the non-compete agreement is not entered into as part of the job offer, the non-competes introduced during employment must be supported by independent consideration. That means consideration that is in addition to the employee being able to keep his or her job. The new law will also not affect non-competes that are part of the sale of a business or non-competes that are part of separation agreements negotiated at the time of employment termination. Thus, if an employee has no right to severance pay at the time of employment termination, then as part of the separation agreement, the employer can introduce a non-compete obligation in addition to the employee’s release as part of the employee’s consideration of the severance pay offered. This article was published in the September 2018 issue of The Reflector.